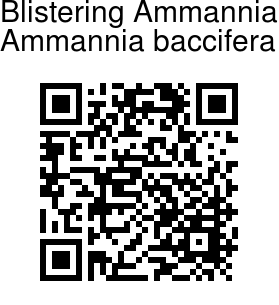 Blistering Ammannia is an erect, branched, smooth, slender, annual herb, found in open, damp, waste places. It is more or less purplish herb 10-50 cm in height, with somewhat 4-angled stems. The leaves are narrow-oblong, oblanceshaped, or narrowly elliptic, about 3.5 cm long - those on the branches very numerous, small, and 1-1.5 cm long – with narrowed base and pointed or somewhat rounded tip. 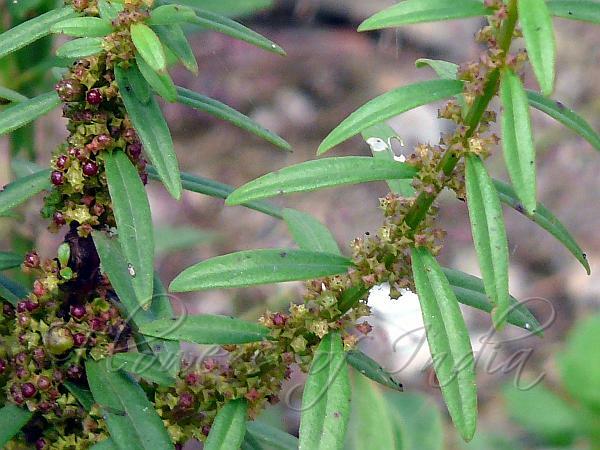 The flowers are small, about 1.2 mm long, greenish or purplish, and borne in dense clusters in leaf axils. The capsules are nearly spherical, depressed, about 1.2 mm in diameter, purple. The seeds are black. The common name comes from the fact that the leaves are exceedingly acrid, irritant, and vesicant, and are being used by the village-folk to raise blisters, being applied to the skin for half an hour or a little longer. Medicinal uses: The leaves or the ashes of the plant, mixed with oil, are applied to cure herpetic eruptions. The fresh, bruised leaves have been used in skin diseases as a rubefacient and as an external remedy for ringworm and parasitic skin affection.